12.03.06 For his last at board with the white pieces in this match, Vladimir Kramnik chose 1. d4 again but this time around, rather than a Catalan, Deep Fritz played into a super-solid Nimzo-Indian Defence. 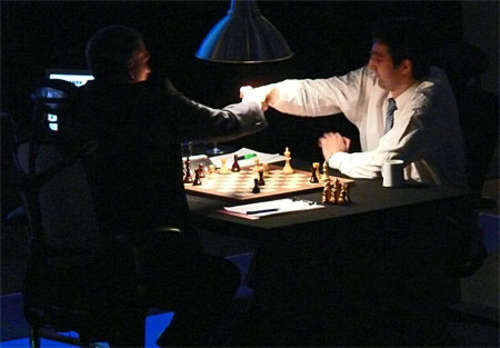 As this was Kramnik's last chance for a win in this match he fought ferociously. A victory was not to be however as the computer forced a triple repeat of position and secured the draw in thirty-five moves. This game brings into high relief just how difficult it is--even with an advantageous poition--to beat Deep Fritz. 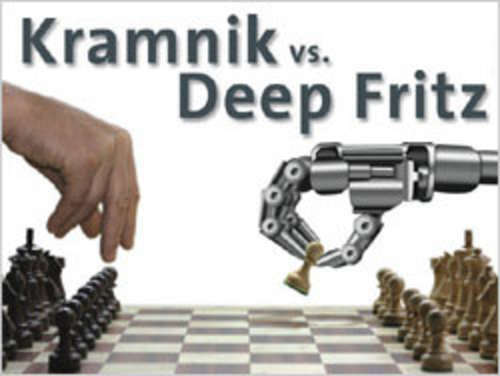 Current match score: Kramnik 2 - Deep Fritz 3. Watch Game 6 here via our LIVE Game Link. The draw is agreed in Game 5. With a win on Tuesday Kramnik can draw this match. Replay Game 5 here. After loading the game you can use the controls at the bottom of the notation window to play, pause and advance the game move by move. 1.d4 Nf6 2.c4 e6 3.Nf3 d5 4.Nc3 Bb4 5.e3 0-0 6.a3 Bxc3+ 7.bxc3 c5 8.Bb2 Nc6 9.Rc1 Re8 10.Bd3 dxc4 11.Bxc4 e5 12.dxe5 Qxd1+ 13.Rxd1 Nxe5 14.Nxe5 Rxe5 15.Be2 Bd7 16.c4 Re7 17.h4 Ne4 18.h5 Ba4 19.Rd3 b5 20.cxb5 Bxb5 21.Rd1 Bxe2 22.Kxe2 Rb8 23.Ba1 f5 24.Rd5 Rb3 25.Rxf5 Rxa3 26.Rb1 Re8 27.Rf4 Ra2+ 28.Ke1 h6 29.Rg4 g5 30.hxg6 Nxf2 31.Rh4 Rf8 32.Kf1 Nh3+ 33.Ke1 Nf2 34.Kf1 Nh3+ 35.Ke1 ¬‡-¬‡. 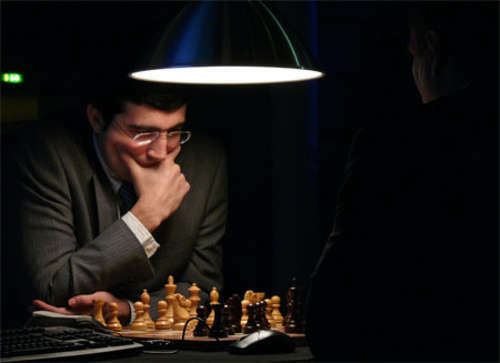 Kramnik digging hard in Game 5. 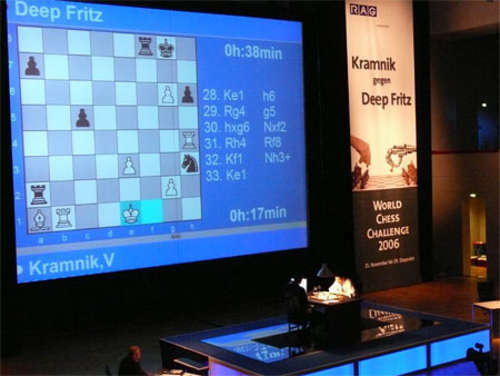 Deep Fritz will repeat the position and the game will be drawn in two more moves.